Happy Wednesday, folks! My friend Shannon from The Heavy Purse recently wrote a super-cool children’s book titled “The Lemonade Stand.” And I know I’m totally biased, but I think it’s ahhh-maz-ing. In fact, it has quickly become one of my children’s favorites. The book starts out with a few little boys begging their mom for toys at the store. But, being small kids and all, they don’t have enough money to buy what they desire. Shortly after that, the boys meet up with their friends Lauren and Taylor and hatch a plan to raise some funds. And after purchasing supplies and hosting a lemonade stand on a hot summer day, the kids raise a total of $30. I love it. Nothing but sweetness ensues from that point on with the kids each splitting their share of the profit into separate funds for saving, sharing, and spending. Even better, a few of the kids donate part of their earnings to the local animal shelter. The bottom line: “The Lemonade Stand” manages to take a fairly common occurrence (a lemonade stand) and turn it into a tale with valuable lessons for parents and kids. If you’re looking for a book to read your children or give as a gift, I highly recommend it! 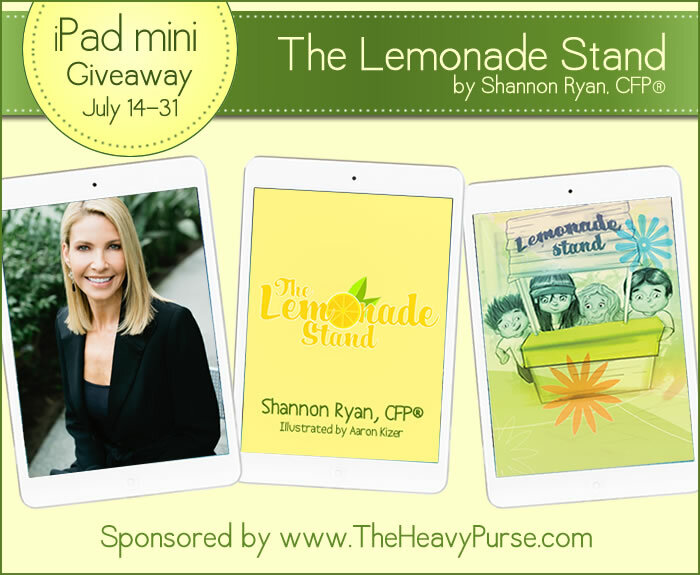 Now, on to the giveaway…..
Join Lauren and Taylor in their continuing money adventures in The Lemonade Stand by Shannon Ryan, CFP®. Shannon is a Mom on a mission to help busy parents teach their children simple, value-based principles that guide their money decisions and support their long-term financial well-being. Help us celebrate the release of The Lemonade Stand and join Shannon in her mission to increase financial literacy in both children and adults. NextWho Wears the Financial Pants in Your Family? This book sounds great! I am really trying to make my son understand that my debit card is not a credit card and you have to save up to purchase things you want. I THINK he is getting it but there really is not enough financial education out there for kids. It sounds like you’re off to good start with your son, Catina. It’s an unfortunate reality that there is so little financial education for kids available. It’s really up to parents to guide their kids and teaching them to save for the things they want is a great place to start!